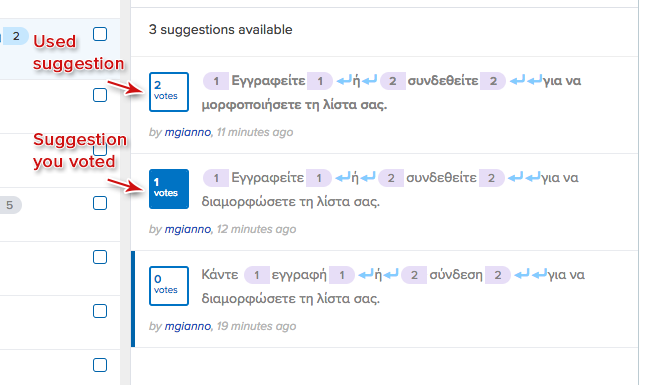 When crowdsourcing mode is enabled for a project, you'll only be able to make translation suggestions and vote on them. The suggestion with the most votes and meets the minimum votes threshold will automatically become the selected translation for that string. From the strings list on the left, click on the string you want to add a suggestion for. Your selected string will appear on the right hand side in the source string area. Click the Suggest translation button, found right below the source string area. Type your translation in the translation area that opens. Your newly added suggestion automatically gets your vote. From the strings list on the left, click on the string you want to add a suggestion for. Your selected string will appear on the right hand side in the source strings box. Type your suggestion into the suggestion box. Your suggestion will automatically get one vote (from you). If a string has a Translation Memory suggestion, you can create a new suggestion from the TM entry and let others vote on it. When you see a suggestion you like, hit the vote button to the left of the suggestion to vote on it. Your voted suggestion is highlighted so that you can easily see what you have voted for. To keep things fair, you're only allowed to vote on one suggestion per string. But if you ever change your mind, or see another suggestion you like better, you can unvote, or vote for the other suggestion. When a string has many suggestions and votes, the suggestion with the most votes is used as the translation of the string. This is called the 'Used suggestion' and is always the first suggestion in the list, having bold letters for the actual translation. 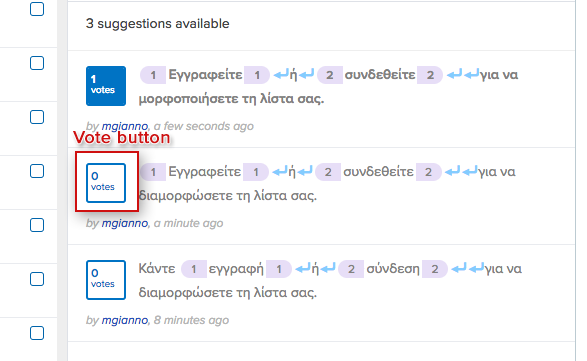 If you disable the crowdsourcing mode for a project, the suggestions shared by the community are kept, both ones that are saved as translations as well as the ones which are simple suggestions. The votes, however, will be deleted.